It makes an uneasy partner (shall we say!) in this context. 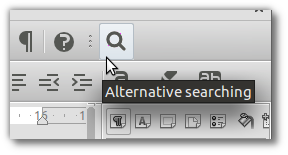 I have tried to find out how to change the icon of an extension, but the "Alternative Searching" toolbar does not show up in the Tools > Customise... menu, nor does the Tools > Extension Manager... give access to this kind of modification. 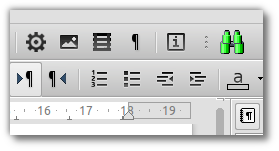 I have seen a previous answer to a question about the location of toolbar icons, but this seems not to cover extensions. Any help out there? I live in hope! Perhaps use /sfx2/imglst/actionaction012.png or /cmd/lc_searchdialog.png from the flat icon set. They will need to be rescaled (for the _16 versions) and saved as BMP using "magic pink" for transparency. It worked. :) Actually, though it's *_26.bmp, not *_24.bmp. I'm not quite sure how one gets the "transparent" bg with a BMP, but I just went with #ccc, and it's close enough. Better than the green, anyway! Is this better? @Pedro beat me to it. I wish the extension in question would just drop the old Windows icon technology and use PNGs. @David, I updated my answer to correct the BMP names. Thanks for that. Thanks @Pedro & @oweng - did I mention BMPs are a pain? ;) Getting rid of the "halo" was getting irksome, so I called it a day. Improved yet further, but there would be two advantages to extension author updating icons to PNG: (1) would be better!, and (2) he would lose the red "Warning" about no new update in a year from the download site. Thanks again for help with this trivial matter - appreciated! @oweng - Btw - I used the "search" icon from the SVG set (rather than PNG) as suggested in your original reply. Rescaling the PNG made for a fuzzy icon, but could set SVG to proper size in Inkscape, export, and keep things crisp. FWIW! Great! Thanks a lot! I preferred editing the icons directly in place (e.g. somewhere under ".../libreoffice/4/user/uno_packages/cache/uno_packages/....tmp_" and simply converted the original icons to BW and added "Magic Pink" background. Although I still have a few color icons in the new Sifr icon style (e.g. Save As, optimum column width, insert/delete column/icon, etc.) which look a bit out of place among the rest of the icons.